They say March comes in like a lion and goes out like a lamb. This month has always been the connection between winter and spring. And like March, brunch is the connection between breakfast and lunch favorites. Maybe this is why most people think of brunch this time of year? Whether you are planning a brunch for a baby shower, wedding shower, Mother’s Day, birthday, or the fast-approaching Easter holiday, the brunch get-together can be as simple or as elegant as you choose. By now we are ready for spring and warmer weather, and while we can’t choose what kind of day Mother Nature will give us in the spring months, brunch is bright and warm, so keep your atmosphere in tune with the (mostly) sunny season. Colors like yellow, light blue, soft greens, lavender, and pink are all springtime favorites. Picking just two or three spring colors will keep your party from looking like an explosion of Easter jellybeans. 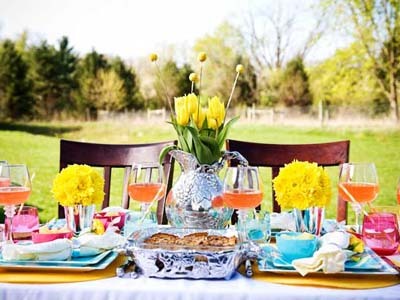 For a fun garden party, weather permitting, set up a vintage outdoor seating area with brightly colored tablecloths, mix-matched china and silver, and place spring flowers like daisies and tulips in colorful vases. If you prefer your party indoors, bring bright colors inside placing flowers throughout either in the same tone or have fun with different colors, sizes and types. Set the pots in baskets for more of an outdoorsy feel. Often when think of brunch we think of make-your-own menu items such as omelets with an array of fillings, or freshly pressed waffles with sweet toppings. These ideas are fun and will always be classic to the brunch menu. 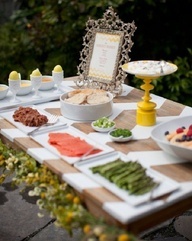 More currently, we are beginning to see brunch stations branch out into eggs Benedict stations complete with flavored hollandaise sauces, vegetables, ham, salmon, and an assortment of toasts. Also gaining popularity are crepe stations. This lighter pancake can be filled with sweets like peanut butter, jellies, or chocolate and can also be filled with savory foods like cheeses, deli meats, or vegetables. A station can be set with almost any kind of brunch menu, pancakes, scrambled eggs, hash browns or yogurt parfaits. For more of a lunch twist, items like a pasta or mini sandwich stations work well. When creating your station, think of filings and toppings that typically go with the food you are serving like syrup, whipped cream and fruit for waffles, then think of surprise foods to put out, like bacon crumbles, spiced nuts, or for a real treat, ice cream. Many restaurants that serve brunch now offer the ever-popular Bloody Mary bar. This is also a very easy way for an at-home host to set up a bar and let the guests serve and create themselves! By simply setting out pitchers of tomato juice, one spicy and one regular, a bottle of premium vodka with shot glasses (for measuring), and a few fun garnishes like pickles, olives, salami, cheese squares, and whatever hot sauces you have on hand, a Bloody Mary bar can be an easy addition and wonderful conversation piece to any brunch party. 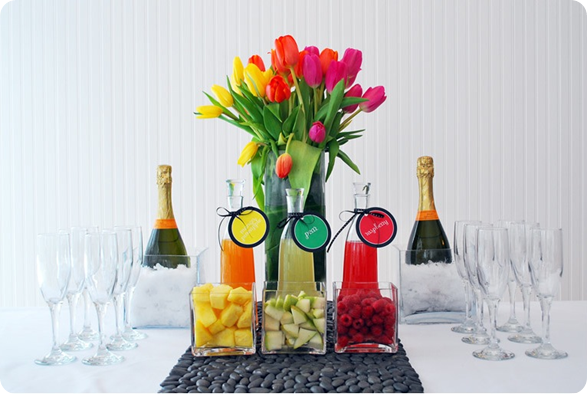 For a lighter breakfast cocktail, mimosa bars are a brighter alternative, perfect for spring. With sparkling wine, an assortment of citrus juices like classic orange, grapefruit, limeade, and lemonade, you have an instant mimosa bar! For garnishes, use a variety of fruits cut into small pieces. For a kid-friendly mimosa bar offer sparkling cider too. Other good drinks to have on hand are fresh brewed coffee, iced tea and lemonade.